But they don’t do IT (whatever IT is). There is always an excuse. My students often say “See you in class tonite”, when they see me or speak to me on the phone but then don’t come. Teacher training, painting, any class – as if it didn’t matter, or I wasn’t listening or didn’t care. I am listening class, and it does matter and I DO CARE. At the very least you are going against the Yamas. I know that life is hectic, but what is your priority? Are you like the guy who says “I will see you on Saturday” (or whenever), and has his fingers crossed behind his back and has neglected to say “if something better doesn’t come up”. Think about it. Yoga isn’t an exercise regime. 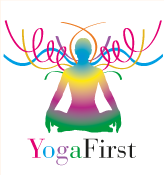 It can be, but it was designed as a whole health program for the body the mind and the spirit – hence the name “YOGA” which means “to yoke”. Not to yoke you to something that is meaningless or unpleasant, but to a way of doing and being that will change your life, entirely, and for the better. I just love ETON MESS, but who can afford the calories every day ( a portion of regular Eton Mess is about 600 calories!). I can use all kinds of justifications, but, the main reason I like it is that it is DECADENT. “Splurgy”. The one in the photo above… it’s my breakfast. I have even added a tablespoon of Special K. You can leave that out if you are making a dessert..
Who can afford the calories of a big dessert, not me! I like to save my calories and spend them on other things, especially when there is an alternative, and there is one here. So I have devised a lovely lean version based on my very own yoghurt – although you can use store bought Greek. It takes hardly any time to make and you can do a version for one person – handy seeing I AM one person. 1. 150g low-fat Greek yoghurt or your own yoghurt. If you use low fat you can add almonds, if you use full-fat, then you should cut out the almonds/nuts, or at least be spartan when you add them. 2. A dessert-spoon of breakfast cereal. You can use granola, but take care of the calories. I use plain oats or rice flakes, however you have to leave it a little while if you use rice flakes because they need to soften. 3. A handful of fresh or frozen berries (whichever you prefer). Blackberries, raspberries, blueberries – I freeze my own berries, and happily, I still have some left from last summer. I have been told that some people add freeze dried berries, but you may only need this if your own berries are tasteless. It also adds another layer of cost. 4. Two teaspoons of toasted almonds (or preferred nuts – macadamias are yummy, but high in calories). I even like to mix in a little almond essence, instead of the usual vanilla. 5. A sprinkle of coconut adds a taste I enjoy. Not really in keeping with the Eton mess aficionados/purists, but tastes good. You can see the shredded coconut in the picture above – keep in mind it is my breakfast. GENTLY mix the above together, and leave it a little while. 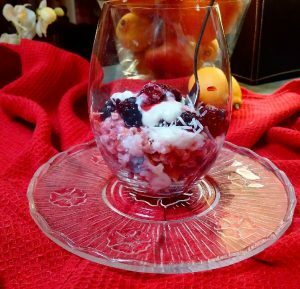 If you do have the time…the juice of the berries seeps into the yogurt, and everything tastes even more wonderful. Let me know how you make yours.